چنارانی, حسین, خمری, مریم, شیرکوند, ناصر, عاشوری, جمال. (1396). تأثیر آموزش گروهی مهارت‌های زندگی بر سلامت عمومی و کیفیت زندگی پرستاران. سلامت جامعه, 10(3), 19-27. حسین چنارانی; مریم خمری; ناصر شیرکوند; جمال عاشوری. "تأثیر آموزش گروهی مهارت‌های زندگی بر سلامت عمومی و کیفیت زندگی پرستاران". سلامت جامعه, 10, 3, 1396, 19-27. چنارانی, حسین, خمری, مریم, شیرکوند, ناصر, عاشوری, جمال. (1396). 'تأثیر آموزش گروهی مهارت‌های زندگی بر سلامت عمومی و کیفیت زندگی پرستاران', سلامت جامعه, 10(3), pp. 19-27. چنارانی, حسین, خمری, مریم, شیرکوند, ناصر, عاشوری, جمال. تأثیر آموزش گروهی مهارت‌های زندگی بر سلامت عمومی و کیفیت زندگی پرستاران. 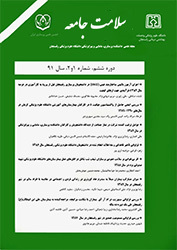 سلامت جامعه, 1396; 10(3): 19-27. 1کارشناس ارشد مشاوره خانواده، دانشگاه آزاد اسلامی، واحد قوچان، گروه مشاوره، قوچان، ایران. 2کارشناس پرستاری، دانشکده پرستاری و مامایی، دانشگاه علوم پزشکی زابل، زابل، ایران. 3مربی علوم تربیتی، دانشگاه فرهنگیان، پردیس زینبیه پیشوا، تهران، ایران. 4دکتری روانشناسی، گروه روانشناسی، دانشگاه آزاد اسلامی، واحد اصفهان (خوراسگان)، اصفهان، ایران. مقدمه: شغل پرستاری به دلیل استرس‌زا بودن موجب کاهش سلامت و کیفیت زندگی می‌شود. آموزش مهارت‌های زندگی به عنوان یک روش آموزشی می‌تواند سلامت عمومی و کیفیت زندگی پرستاران را ارتقاء دهد. این مطالعه با هدف بررسی تأثیر آموزش گروهی مهارت‌های زندگی بر سلامت عمومی و کیفیت زندگی پرستاران انجام شد. مواد و روش‌ها: این مطالعه تجربی با طرح پیش­آزمون و پس­آزمون بود. جامعه آماری این پژوهش پرستاران بیمارستان‌های شهر ورامین در سال 1394 بودند. در مجموع30 پرستار با روش نمونه‌گیری در دسترس انتخاب و به طور تصادفی در دو گروه جایگزین شدند. گروه آزمایش10 جلسه70 دقیقه‌ای به صورت گروهی با روش مهارت‌های زندگی آموزش دید. گروه‌ها پرسشنامه سلامت عمومی (GHQ) گلدبرگ و هیلیر و پرسشنامه کیفیت زندگی (LQQ) سازمان بهداشت جهانی را تکمیل کردند. داده‌ها با روش تحلیل کوواریانس چندمتغیری تحلیل شدند. یافته‌ها: بین گروه‌های آزمایش و گواه در سلامت عمومی و کیفیت زندگی تفاوت معناداری وجود داشت. به عبارت دیگر آموزش گروهی مهارت‌های زندگی به طور معنی­داری باعث افزایش سلامت عمومی (737/149=F) و کیفیت زندگی (415/129=F) پرستاران شد (001/0>p). نتیجه‌گیری: آموزش گروهی مهارت‌های زندگی می‌تواند در افزایش سلامت عمومی و کیفیت زندگی پرستاران اثربخش باشد. بنابراین، مشاوران و درمانگران در کنار سایر روش‌ها می‌توانند از روش مذکور برای افزایش سلامت عمومی و کیفیت زندگی استفاده کنند. 1MSc of Family Counseling, Department of Counseling, Quchan Branch, Islamic Azad University, Quchan, Iran. 2BSc in Nursing, Faculty of Nursing and Midwifery, University of Medical Sciences, Zabol, Iran. 3Instructor of Educational Science, Farhangian University, Zeynabiyeh Pishva Branch, Tehran, Iran. 4PhD of Psychology, Dept. of Psychology, Islamic Azad University, Isfahan (Khorasgan) Branch, Isfahan, Iran. 1- MSc of Family Counseling, Department of Counseling, Quchan Branch, Islamic Azad University, Quchan, Iran. 2- BSc in Nursing, Faculty of Nursing and Midwifery, University of Medical Sciences, Zabol, Iran. 3- Instructor of Educational Science, Farhangian University, Zeynabiyeh Pishva Branch, Tehran, Iran. Introduction: Nursing as a stressful job has detrimental effects on health conditions and nurses’ quality of life (QOL). Training courses of life skills could improve and increase the general health conditions and quality of life of the nurses. So, this study aimed to investigate the effects of these courses on the two aforementioned parameters. Materials and Methods: This experimental study with a pre-test and post-test design was conducted on all nurses working in the Varamin city hospitals in 2015. Overall, 30 nurses were selected through available sampling method and randomly assigned into two groups. The experimental group received 10 sessions of 70- minute. of training with group life skills method and the control group received nothing Both groups completed the questionnaires of Goldberg & Hillier’s general health (GHQ) and World Health Organization’s life quality (LQQ). Data was analyzed by multivariate analysis of covariance method. Results: There was a significant difference between the experimental and control groups in the general health and QOL. In other words, group training of life skills significantly enhances the general health (F=149/737) and QOL (F=129/415) of the nurses (p<0/001). Conclusion: According to the findings of this study, the group training of life skills can be effective in improving the general health conditions and Olaf nurses. So, counselors and therapists could use the group life skill method along with other methods to increase these two health and life parameters. Kowalski C, Ommen O, Driller E, Ernstmann N, Wirtz MA, Köhler T, et al. Burnout in nurses–the relationship between social capital in hospitals and emotional exhaustion. JCN 2010; 19(11‐12):1654-63. Tully PJ, Baumeister H, Bennetts JS, Rice GD, Baker RA. Depression screening after cardiac surgery: A six month longitudinal follow up for cardiac events, hospital readmissions, quality of life and mental health. IJC 2016; 206:44-50. Webel AR, Sattar A, Schreiner N, Phillips JC. Social resources, health promotion behavior, and quality of life in adults living with HIV. ANResearch 2016; 30: 204-9. World Health Organization. The world health organization quality of life (WHOQOL)-BREF. [cited 2017 January 17]. Available from: http://www.who.int/mental_health /publications/ whoqol/en. Zonderman AB, Ejiogu N, Norbeck J, Evans MK. The influence of health disparities on targeting cancer prevention efforts. AJPM 2014; 46(3):S87-S97. Figueira HA, Giani TS, Beresford H, Ferreira MA, Mello D, Figueira AA, et al. Quality of life (QOL) axiological profile of the elderly population served by the Family Health Program (FHP) in Brazil. AGG 2009; 49(3):368-72. Uysal M, Sirgy MJ, Woo E, Kim HL. Quality of life (QOL) and well-being research in tourism. Tourism Management 2016; 53:244-61. Cepeda-Valery B, Cheong AP, Lee A, Yan BP. Measuring health related quality of life in coronary heart disease: the importance of feeling well. IJC 2011; 149(1):4-9. Evans RW, Manninen DL, Garrison Jr LP, Hart LG, Blagg CR, Gutman RA, et al. The quality of life of patients with end-stage renal disease. NEJM 1985; 312(9):553-9. Chen Y-L, Pan A-W, Hsiung P-C, Chung L, Lai J-S, Gau SS-F, et al. Life Adaptation Skills Training (LAST) for persons with depression: A randomized controlled study. JAD 2015; 185: 108-14. Salimi BH, Abedi F. The effectiveness of life skills training on anxiety, depression and happiness of secondary school students mothers in Karaj city. JCP 2013; 11(3): 29-48. LOU C-h, WANG X-j, TU X-w, GAO E-s. Impact of life skills training to improve cognition on risk of sexual behavior and contraceptive use among vocational school students in Shanghai, China. JRAC 2008; 19(4):239-51. Shin L, Orr S, Carson M. Regional Cerebral Blood Flow in the Amygdala and Medial Prefrontal Cortex During Traumatic Imagery in Male and Female Vietnam Veterans With Ptsd. Year Book of Psychiatry & Applied Mental Health 2005; 2005:167-8. Savoji AP, Ganji K. Increasing Mental Health of University Students through Life Skills Training (LST). Procedia-Social and Behavioral Sciences 2013; 84:1255-9. Nooripour R, Matacotta J, FayazBakhsh A. Evaluation of a life skills training workshop aimed at improving quality of life in Primipara women. Nooripour R, Matacotta J, Bakhsh AF. Evaluation of a Life Skills Training Workshop Aimed at Improving Quality of Life in Primipara Women. IJPBR 2014; 3(6): 614-9. Goldberg DP, Hillier VF. A scaled version of the General Health Questionnaire. Psychological medicine 1979; 9(01):139-45.